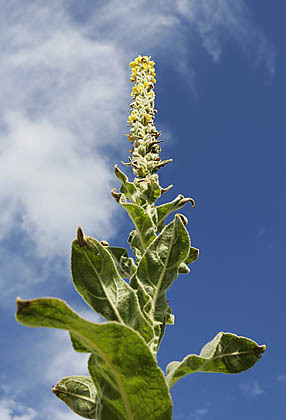 It seems strange that the mullein with its splendid exterior and legendary healing properties is only a biennial. In the first year of growth we only see the pretty rosette of leaves covered with grey hairs. In the second year a stem densely set with velvety leaves and covered in yellow flowers in the upper part grows up from the centre of the rosette. 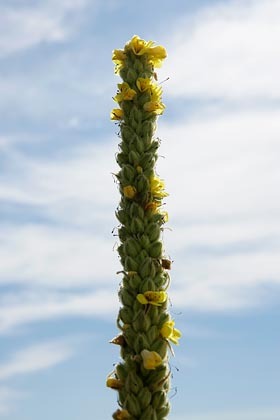 In general the name mullein is better known than the plant itself. After flowering and ripening of seeds the plant dies. In nature plants have many different tricks to preserve the species. Of the large number of seeds from the mullein only a few germinate in the following spring, the remainder stay in the ground, waiting, if needs be even for centuries. On average a plant produces more than one hundred thousand seeds.